Written by Matty Cohen on January 9, 2018 Blog. 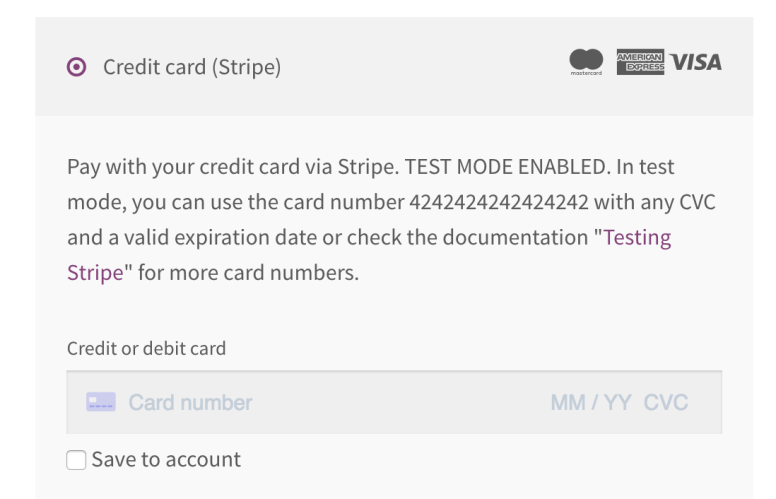 WooCommerce Stripe now fully supports Stripe’s “Sources” feature, a new way to receive payments through Stripe. Payment gateways (“sources”) include the default payment gateway we all know and love, Apple Pay, Bitcoin, and a new selection of European and other non-U.S. payment gateways offered through Stripe. Visit our WooCommerce Stripe documentation for a list of supported sources. A list of several supported Stripe Sources, for illustration purposes. You can enable as many of the above sources as you’d like, at the same time! We’ve introduced a new credit card form on the WooCommerce checkout screen. This uses Stripe’s new “Elements” feature, which creates and displays the credit card form entirely via Stripe. This means the credit card form is fully PCI compliant, and the credit card information is sent directly to Stripe, without interacting with your store. A new fully PCI-compliant credit card form, at checkout. This may slightly change the look and feel of your credit card form, although we’ve done our best to preserve the design of the previous one. The Stripe Elements credit card form, in action. Ready to give WooCommerce Stripe 4.0 a shot? Review our documentation about how to update, make sure backups are in place, and then grab the update in WP Admin. We’d like to know what you think of the release and what you’d like in the next one, so let us know in Comments! Think you’ve found a bug with WooCommerce Stripe 4.0 or a conflict with another plugin? Report it via our GitHub issue tracker. Need help with the upgrade? Contact us via our Support page. Want to chat about the release, or have a great idea for the next version? Start a discussion on the public WooCommerce Stripe forums at WordPress.org. Please note that we are not able to diagnose or solve potential issues in blog comments. The fastest way to get in touch is one of the methods listed above. Slows down my checkout extremely. The spinner isn’t stopping.. I originally had problems with 4.0.0 and Apple Pay not displaying. Now, I just installed 4.0.1 and still have issue with Apple Pay not displaying; AND also having a new issue with Apple Pay killing mobile menu on product pages only (hamburger doesn’t do anything when pressing). First I noticed disabling the Stripe plugin allowed the mobile navigation to work. Then I unchecked the Apple Pay feature and my mobile menu works again. Confirmed on desktop, android, and iphone. Running Storefront theme and Woo 3.2.6. We sell “events”, not physical products. Is woocommerce able to do this!? Does it need an extension, like “eventcallendarPro”? This will work with WooCommerce. I’d recommend WooCommerce Box Office, our events ticketing extension, for this. Matty, do you have a link to a site or demo using Woo Box Office? I’d like to see it in action to compare it to Events Calendar Pro and their ticketing add on. There is a link. click on the name of the plugin. While we don’t currently have a demo available for Box Office, here’s a case study of how we used Box Office to sell tickets to WooConf. Hi. Thanks for the update. When “Enable guest checkout” is NOT enabled, will Apple Pay still check out as guest if the buyer is not logged in or will it now actually create a proper account? How is this “Fully PCI compliant”? Or maybe a better question is — what exactly do you mean by “Fully PCI compliant”? – All Stripe users must validate their PCI compliance annually. – Stripe “Checkout” and Stripe “Elements” require the “SAQ A” form (the simplest method of PCI validation). So this new version-4 of the Stripe plugin for WooCommerce does NOT mean we don’t need to submit a PCI compliance form. And, I’m not clear how this new Stripe “Elements” version of the plugin is any better than the prior version, which (I think) offered Stripe “Checkout” mode — since both modes still require SAQ-A validation. I could be misinformed, or misunderstanding something here, but in any case, I’d like some clarification on what you mean by “Fully PCI compliant” for the new Stripe plugin. I too would like to know how this new plugin differs from previous versions regarding PCI compliance. @tex77 If you check in your Stripe account under Business Settings > Compliance – If you can answer three questions about collecting card data with tokenization, on pages with SSL, and never saving card data on the server then Stripe will complete a PCI assessment for you. Stripe Elements (the new credit card form on checkout) is generated in a secured iFrame by Stripe. When a customer inputs their credit card information at checkout, this information goes directly to Stripe for payment, without interacting with your Woo store’s server at all. This helps to prevent against bad actors, and helps Stripe to assist with the simplest form of PCI compliance, and generate the self assessment questionnaire on your behalf, to complete and submit. cant i remove the iframe which has wrapper the inputs? because in order to use card swipe we need to access the fields. because of iframe we couldn’t use it. so please help us! Backed up, upgraded and tested successfully with one hiccup. The credit card icons are now missing from my checkout screen. They reference the file “stripe-paymentfonts.css”. As an example the Diners card has html conten value of “\f013”. Now my checkout screen just shows a square instead of card image. I’ve cleared cache etc. Any suggestions? If you are not seeing the icons, the webfont might be missing… On one of my sites it is located here: url(../paymentfonts/paymentfont-webfont.eot) – this would be in relation to the css file. Can you check if it’s there? You could also be running into a cache issue even after clearing your browser cache. Can you send a link? Just noticed “squares” only show up in Chrome. IE shows nothing. Also, the previous version of Stripe showed icons just fine so I’m really trying to figure out what else changed here. That worked great, Bryan. Thanks for your help. Interesting integration with Google Pay. Is there a way to remove the old checkout button is Google Pay is offered? Vice versa? While there isn’t currently a quick way to do this, I’d recommend logging this as an enhancement request on the WooCommerce Stripe GitHub repository, for further discussion. So, let me get this right, implementing this plugin will enable me to accept secure credit card payments on a http (not https) website by using stripe own ssl certificate? Is that right? Stripe will require you to load checkout pages using https – whether it’s technically possible or not. Is it necessary or advised to upgrade the Stripe API version when performing this WooCommerce Stripe plugin update? WooCommerce Stripe 4.0 uses the latest version of the Stripe API. Any settings for the API version in your control panel should be at the latest version as well, although there should be no changes required, to my knowledge. I just upadated and it all looks good, but Apple Pay has now gone? Was working nicely before. Am I missing something? Update broke my Apply Pay as well. Just successfully configured the night before. Bummed, especially after reading how much testing went into this. Does this allow subscriptions to be used with apple pay, any idea when that will be supported? Does stripe provide a card reader? Great work! Unfortunately, the payment process got very slow with the new update. Is it possible to remove the Apple Pay and the Pay button on the single product page? I hate this new update. That is all. I own a very small rental shop, where customers can rent polaroid cameras. Is it possible to authorise a creditcard with Stipe 4.0 and manullaly hold a certain amount or “release” a certain amount from customers? For example like some kind of deposit? Hello I am using stripe for my website http://www.boutiqueottoman.com Is this plug-in has 3D Secure feature? Yes, WooCommerce Stripe 4.0 includes support for 3D Secure. Does this support Apply Pay subscription? Apple Pay tokens can be used to create one-off payments or subscriptions. For repeat purchases that are not related to a subscription, we recommend you create single-use tokens. Your customer must authenticate with the Apple Pay payment sheet each time—attempting to reuse payment information for a non-subscription payment can result in it being declined. A customer would need to re-authenticate with the payment sheet periodically, before being charged the recurring payment. It’s probably a good update under the hood. But the new checkout card / expiry / cvc form is terrible. Will be a conversion killer on some sites I am sure – whether you go for the in line design or the row of 3 fields, they’re poorly labelled. What about eshops in Greece, can we use this payment gateway in Greece? Stripe isn’t currently offering a Greek payment option. You could, however, request that Stripe add support for Greece, and be notified when they do. The current installations use Stripe.js (which is fully PCI compliant) and we’ve been taking card payments from UK/EU cards for a long time. Can you explain what the difference is here? The new features enable payments to be received via European and other non-U.S. banks. For example, in the Netherlands, a merchant can now receive their funds using iDeal, and a local Dutch bank account. Is subscription with recurring payment and SEPA now working? This would be great! This is now possible using SEPA Direct Debit, WooCommerce Stripe, and WooCommerce Subscriptions, yes. For more information on how this works with SEPA Direct Debit, please do see Stripe’s documentation. Sorry for newbie question, but does this mean we can use Stripe on http:// websites now? I would highly recommend an SSL certificate for any website created which is receiving payments. Although technically possible to use HTTP, I’d advise to err towards using HTTPS (adding an SSL certificate to your website) for each website in your care. Most hosts offer a free SSL certificate, these days, using efforts such as Lets Encrypt. Have you guys fixed the Stripe Payment Gate Way translation yet? There are a lot of people facing issues to translate it. 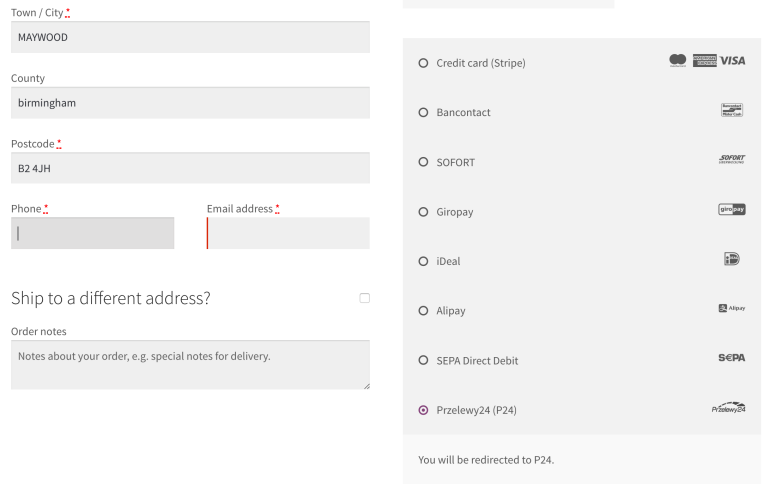 The new fully PCI compliant form is great, however, it’s super ugly – the big grey form sticks out like a sore thumb! Is there any way to ditch the Stripe ui stylesheet and replace with our own custom styles? It’s definitely possible to customise the styling fo the credit card form, yes. Stripe has documentation around how this can be done. I’d recommend logging a ticket with our Happiness Engineers, if you have additional questions around this. How can a U.K. based store take advantage of Stripe sources gateways – such as iDeal – without changing the store’s currency to Euros? Generally speaking, a U.K. merchant should use the U.K. supported payment option. Customers can use their local credit cards, regardless of where the card was issued. Sources is intended to be merchant-centric (for example, a Dutch merchant can set up iDeal). To run iDeal in the U.K., you’d most likely need to interact with a Dutch bank account (as a merchant) and set the price to Euros. It’s not currently possible to use iDeal without selling in Euros. You could set up the currency converter widget, though. A bit off topic, but are you aware of any robust currency switching solutions? And, if so, do you think that it would be possible for sources to work? I’ll check it out – thanks Oliver! P.S. I can’t help but think it’s about time WooCommerce brought out an official solution. Hi Matty, if I have more then one woocommerce (more domains) connected to my stripe account and if I like to get Giropay activated, how do I setup a webhook in stripe dashboard? Each WC install shows me a different return url? I’m really glad you found a solution here, Adrian. For anyone reading along at home, Stripe has a great document on webhooks which is a great reference here. I really need to this article. Thank a lot. Thanks for this update and the introduction of 3D Secure ! It seems that the labels on top of the fields have disapeared (credit card number / expiry date / CVC) to be replaced by the only “credit card/debit card” label. Is there anyway to get them back ? Great Service!! When can we expect this WooCommerce Stripe 4.0 in India? Thanks. Stripe and paypal is not available to Ghanaians and I live in Ghana so how do I get an online payment gateway to my woocommerce shop? Any chance of Bitcoin being added in the near future? Can someone explain the intended behavior of Apple Pay? Before the 4.0.0 update it was working when you went to checkout. Since updating to 4.0.0 and 4.0.1, it is not displaying on the checkout page And it breaks mobile navigation menu on my product pages. I don’t follow if this is by design but it doesn’t appear to be working as described in the documentation. Any thoughts? Well, Im glad they just release a fix for most of the problems after the first update. All the payment style is working just fine now. But now the language folder has disapeared. together with the .pot file. Can you please put it back. Bitcoin in Stripe 4.0 ? Can we have an idea of when we’ll be able to process Apple Pay payment for recurrent payments (such as subscriptions). Thanks a lot for what you’ve done, the new PCI form looks fire ! When Stripe is coming to India ? Stripe is awesome and we love it. Bitcoin has now been phased out with Stripe. I think this update is a good one. Woocommerce and stripe are a great match. Thanks for the feedback. After speaking with the theme creator they helped me to delete the extra “proceed to payment” button, added by the plugin update. Is there anyways we can get hid of the chrome payment button tho? Hi I have a store setup and primarily operate in South Africa.Can I use this on my site? Extraordinary work! Sadly, the installment procedure got moderate with the new refresh. I will look at it.